The salad includes fresh raw lacinato kale leaves, cut into thin strips, dried sweetened cranberries, toasted pine nuts, freshly grated Parmesan cheese, and a vinegar-rich balsamic vinaigrette, sweetened with a little honey. 1 Heat a small skilled on medium high heat. Spread the pine nuts in an even layer on the bottom of the pan, cook, stirring occasionally, until lightly browned. Then remove to a bowl to allow to cool. Hint when toasting nuts: do not take your eyes off of them! Nuts can go from browned to burned very quickly. 2 Use a sharp knife to cut out the tough midrib of each kale leaf, and discard or compost. Slice the leaves crosswise into thin, 1/4 inch wide, slices. The easiest way to do this is to work with a small bunch of leaves at a time, stack the leaves and roll them into a loose cigar shape. Then using a sharp knife, work from one end of the "cigar" to the other, slicing a 1/4 inch off from the end. Place the kale slices into a large bowl. 3 In a smaller bowl, whisk together the balsamic vinegar, olive oil, rice vinegar, honey, salt, and pepper. 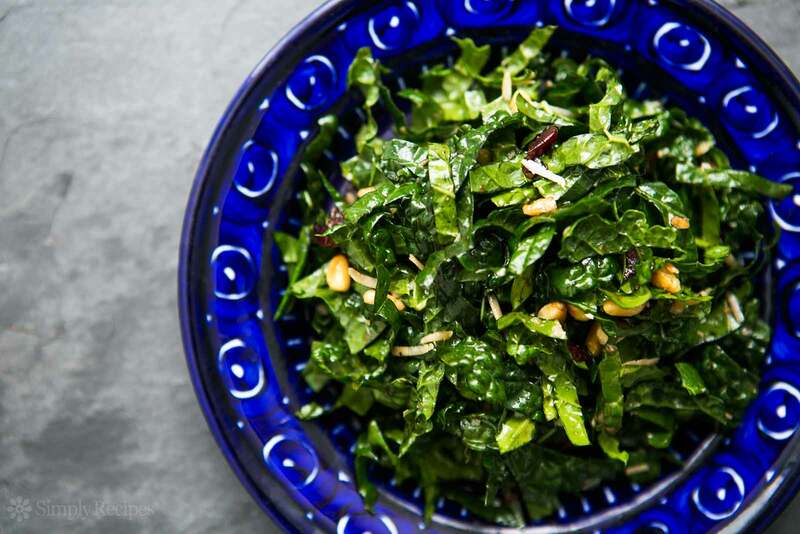 A half hour to an hour before serving, toss the kale together with the toasted pine nuts, the dried cranberries, and the dressing, allowing the kale to marinate a bit. Right before serving, stir in the grated Parmesan cheese.